There is good evidence to suggest that trees are a great benefit to residential landscapes, for example house prices have been found to be markedly higher in areas with mature street trees. In the recently published Landscape Institute guidance ‘Profitable Places’, the chief executives of two well-known housing developers have been quoted championing the value of trees in developments. So quality trees are a key element in creating a great first impression of your development. However in the urban landscape, where we are faced with various problems from poor quality soils to a simple lack of space, the question is how to establish trees successfully? 1 Soil volume – Creating sufficient soil volume is critical for tree survival, if you think of a bonsai tree growing in a restricted soil volume you can see it will never reach it’s full potential. This is also true for urban trees, where limited soil volume leads to trees under stress due to lack of water and nutrients. This can make them more prone to pests and diseases, and result in trees with stunted growth and shorter lifespans than those with adequate space for their roots. Research suggests that soil requirements can be calculated based on the soil volume needed to provide enough water to support the tree canopy size at maturity. 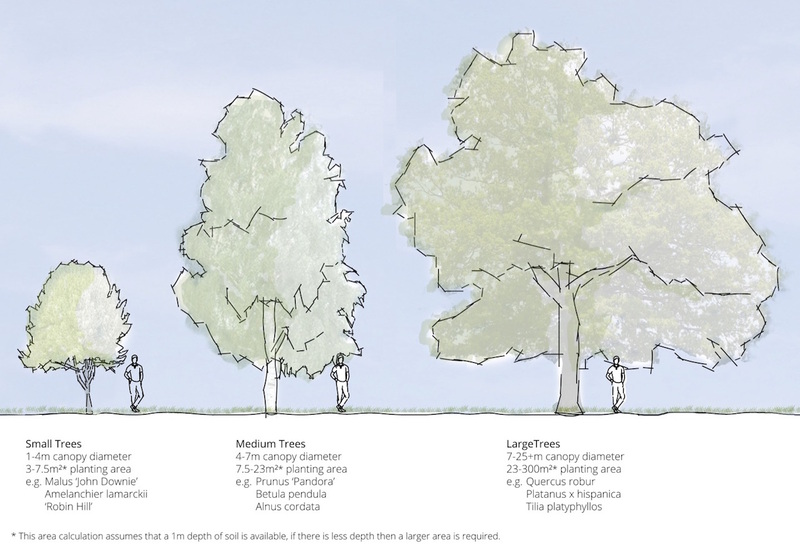 Our rule of thumb guide translates this volume as an area for easy use by anyone designing spaces for trees in their development. If space is limited, as is often the case, there are a variety of proprietary systems which can help. These include reinforced rooting zones that allow roots to grow successfully under paved areas and load-bearing structural soils. As budget is always important, the costs of installing such systems needs to be weighed up against the costs of simply allowing more space at the outset. This will vary between developments and is something your landscape architect can help to advise on. 2 Water – Planning for good access to water will enable a tree to thrive, particularly important during the first two years while it gets established as when a tree is first planted its root system is severely stunted and needs time to grow before the tree can support itself. In the urban environment there are a couple of factors to consider, first there may be a need for hard surfacing around the base of the tree and second is the poor quality ground conditions that may be present. To mitigate this careful preparation of the planting pits is required. Using permeable paving or providing a water reservoir can enable the trees to access a more regular water supply and including a free-draining base to the tree pits allows for good drainage. Frequent watering in the first two years is a must. According to the Forestry Commission ‘Tree Care Guide’, a newly planted standard tree requires 30L (6 gallons) of water every day in Spring and more in hot weather. Rain alone won’t provide enough water especially in the summer when the ground is dry. Planting trees in the winter gives them the best start for a number of reasons but one being that their initial water requirements are much reduced. 3 Air to the roots – Not everyone realises that tree roots require access to oxygen as well as water. Some thought needs to be given to allow the roots access to the air. If there is enough space the best way is to simply leave the surface of the soil open to the air for the area shown in our guide. In a built-up area this is not always possible, as space around trees is often needed for access. In this case there are many proprietary systems on the market, which can help such as soil cell systems that allow air to circulate between the top of the soil and the bottom of the paving build-up. 4 Tree support – Choosing the correct support is essential for good tree establishment. Unsupported trees may suffer root damage from being wind blown before they have a chance to establish a proper root system, they may even topple over. In the urban environment underground anchoring is a popular method because the apparatus is hidden and there are no unsightly stakes to see (or to be vandalised). There is also little maintenance requirement in terms of adjusting ties or removing stakes. The thing to be mindful of is the size of the tree and the ground conditions beneath the tree, which affect the type of anchors that would be suitable for a given location. There are particular situations where anchors cannot be used such as where the soil is shallow and then staking may be the best option. 5 Tree selection – Selecting the correct tree for the location is very important. Depending on the space available a larger or smaller tree species may suit better, our guide gives a few examples. For example, in a homezone or garden very small trees such as an Amelanchiers or ornamental fruit trees may be perfectly appropriate. For streets or avenues, medium sized trees such as Birch or Alder will match the scale of the buildings on either side. 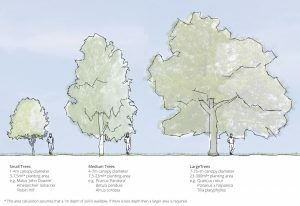 Where there is plenty of space such as in a park or amenity area larger and longer-lived trees should be considered such as Oak or London Plane, planted for future generations to enjoy. Factors such as soil type, wet or dry conditions, sun or shade also play a part in tree selection as well as social factors like whether a deciduous or evergreen tree is more suitable and what time of year they may flower. More detailed analysis will look at how good a tree is at surviving in polluted areas and even things like how likely they are to shed branches or drop large amounts of fruit. There are other factors too and BS8545:2014 has more guidance on this. Aesthetics are of course important but there is no point in planting something that looks good if it won’t thrive in the location, so good species selection is everything. 6 Maintenance – allowing for maintaining a tree is very important and the requirements are straightforward. The most vital thing in the first two years after planting is watering, it is almost impossible to over-water a tree and under-watering it will almost certainly damage it or kill it. Mulching every 6 months with bark or gravel helps retain moisture close to the roots and keeps the weeds at bay. Lastly, checking tree ties and anchors particularly after strong winds makes sure trees are sturdy and safe.